Pianist Randy Weston. Photo by Bob Travis. Music is before language — language has to have music in it to be properly spoken. He could be a Panamanian citizen if he wanted to be, and Jamaica would have an even greater claim. But Randy Weston, a lifelong Brooklyn resident and US Army veteran, emphasizes his African identity. On his mother’s side Weston, who was born in Brooklyn in 1926, is of Jamaican extraction. His father’s people also trace roots back to Jamaica, but his paternal grandmother came from Jamaica to run a bakery during canal construction times, giving birth to his father in Panama. Under Panamanian law the child of a parent who was born in Panama can be Panamanian if she or he wants to be. But Frank Edward Weston, the immigrant businessman raising a family in Brooklyn’s Bedford-Stuyvesant neighborhood, chose things to embrace and things to leave behind. He spoke Spanish as well as English, but “that generation wanted to adapt to America” and he raised his son Randy speaking English in the home. A barber and restaurateur, the elder Weston directed his tall son away from the basketball court and into piano lessons. Across the river in Manhattan the social, cultural and political flowering known as the Harlem Renaissance was in full bloom as Randy was growing up and his dad took him to places in Harlem and the Village to expose him to the likes of Duke Ellington, Eubie Blake and New York’s calypso scene. The elder Weston chose carefully among the educational opportunities available to black people in Brooklyn at the time, sending Randy to Boys High School in Bedford-Stuyvesant and choosing a piano teacher who would let him get beyond the standard classical canon. Boyhood ended with a call to arms at age 18. That took Randy Weston away from Brooklyn and North America — to Okinawa and a year’s exposure to that bit of non-Western civilization. Back in Brooklyn after the war, Randy took over management of one of his dad’s restaurants, a place called Trios. “That’s where all the music was.” Trios became known as quite the hangout for the bebop scene. Added to Trios was the renewed old friendship with Max Roach, also back in the neighborhood. Weston met Charlie Parker and Dizzy Gillespie at Roach’s house. “Brooklyn was very family,” Weston explained. Jazz was all over, but a musician from Kansas City or Detroit had to make a certain pilgrimage to get recognition in the business. “New York was the place. Everyone had to come to New York to prove themselves.” And in that concentrated scene Weston proved and improved himself, acquiring a reputation of his own, working with some of the top people and making music outside of overly formatted boxes. 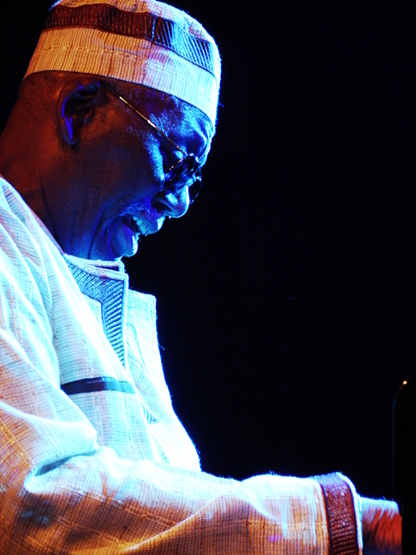 The time came for Randy Weston to take his show on the road — to Africa. In 1960, in collaboration with arranger Melba Liston and with narration by poet and writer Langston Hughes, Weston recorded Uhuru Afrika. In that period he also was noticed for a cover of Nigerian Bobby Benson’s Niger Mambo. The call was getting louder on both ends. A 1963 trip to Nigeria was followed a few years later by a 14-country tour across northern and western Africa, under the auspices of the US State Department. In places like Senegal, Niger, Mali, Sierra Leone, Cameroon, Gabon, Algeria and Egypt he met the first leaders of newly independent African nations. The last stop on the tour was in Morocco, where he received an invitation to come back. And back to Africa Weston did come, playing, learning and running a Tangiers nightclub called African Rhythms. He learned bits of African languages, collaborated with his son and musicians from all over and took a special interest in the music of the Gnawa, originally a sub-Saharan people brought to Morocco as slaves and now a crucial force in Moroccan music and culture. After about five years living in Africa and en route back to Brooklyn, Weston did manage to put in his appearance on the European scene, which by then was broadening its horizons to include an appreciation of sounds coming directly out of the continent to the south. He has been back to Europe a few times, including a special session playing for Queen Elizabeth II. So to what is Randy Weston listening now? Don’t hold your breath waiting for the 89-year-old to release a hip hop album. He doesn’t listen to much new stuff, not even the more recent sounds coming out of Africa. “I collect traditional music, the oldest music I can find,” he said. He’s picking up on new things in the old stuff he visits and revisits. “I’m still listening to Louis [Armstrong]” — and noticing influences and strokes of creative genius that hadn’t been noticed before. Well of course. Humanity originally comes from Africa. People and their brains with “wired in” language. People whose damaged brains can lose the power of speech, but can often be healed with music therapy. Weston cites the example of his late collaborator and arranger, trombonist Melba Liston. She suffered a massive stroke that left her paralyzed on her right side, ending her days of playing the trombone. But she fought back to rewire her brain circuitry, learned to type into a computer with her left hand and had more days of composing and arranging in her before another series of strokes ended her life. And how does a man stay lucid as his 90th birthday approaches? The energy level isn’t there for Weston to be touring anymore, but he says he will never retire. Don’t recent medical studies show that being bilingual delays the onset of Alzheimer’s? And isn’t music a language, or a set of languages?